I’ve tracked down the new photo of the prototype. Here is the article text, but I still don’t have access to the images. An imaginary Apple Macintosh to be introduced in 2004 is discussed; the system is an extrapolation of current technologies that illustrates several key trends. The ‘MAC Ultra’ is said to measure less than one inch thick, run for two weeks on two standard AAAAA batteries, use a sharp, clear flat-panel display and come with 128Mbytes of RAM. Its base configuration includes a 2Gbyte hard disk drive. A fictitious history of the machine is included: the OpenDoc architecture, Object Linking and Embedding (OLE) and integration between cable television and computing changed software paradigms in 1994, as did the addition of intelligent agents. The ‘Next Killer App,’ introduced in 1997, was a graphics recognition engine called RealDraw that supported 3-D models. System 9, in 1999, included a virtual-reality extension. PCMCIA cards began to replace floppy disks in 1995. All Macs had color displays by 1997, and CRT-based monitors were discontinued by 2001. The just-announced MAC Ultra bears an uncanny resemblance to the original Macintosh unveiled 20 years ago — from the front, at least. But when you look from the side or the back or peek inside, nostalgia gives way to awe, as you ponder the technological advances of the intervening decades. For starters, the Ultra is less than an inch thick and weighs less than a pound. It uses a superpowerful 6200 PowerPC chip, and of course, it’s battery-powered, running for about two weeks on two standard AAAAA batteries. The flat-panel color display sports greater visibility and sharper resolution than the original Mac’s monochrome display — and can be detached for use as an overhead display unit. The Ultra’s base configuration — 128 megabytes of RAM, a 2-gigabyte hard drive — makes the original Mac’s specs seem Lilliputian, although most of today’s users will opt for configurations at least twice as large. An optional keyboard is available (with a Dvorak or QWERTY layout), as is a built-in scanner, but most people will prefer to use pen- or voice-based input. You can also get a 3-D mouse for use with multidimensional games and CD-ROM-based educational software. A few productivity applications, such as spreadsheet and page-layout programs, also take advantage of the extra dimension to manipulate complex data. After flirting with friendly English-like names (the Macintosh, the Plus, the Classic, the PowerBook), technoid alphanumeric names (the IIfx, the IIci, the LC 520), and corny neologisms (the Quadra, the Centris, the Performa — and let’s not forget the fiasco of 1995, the Sluggo), Apple adopted a completely new umbrella nomenclature for its increasingly schizophrenic product line. The product lineup from Apple, as of 1995, included modular Macs (in 68040 and PowerPC configurations); workgroup servers; conventional PowerBooks; dockable Duo notebooks; Newton-based PDAs; and the MacPC, manufactured by Dell and based on an Intel chip. After struggling for years to retain the value of the Macintosh brand name when most of Apple’s revenues came from products that were not, strictly speaking, Macintoshes, Apple rechristened the whole shebang the Apple MAC family. No official explanation of the acronym was given, although the pundits were quite quick to offer their explanations (Maggie Canon: Multiple Architecture Chaos; Andy Ihnatko: More Apple Confusion; John Dvorak: My Absolute Consternation). In 1994, application software changed in two dramatic ways, thanks to technologies that made software more adaptive to the needs of individual users. The first of these software paradigm shifts was Apple’s OpenDoc architecture, a standard for mixing and matching software components. Endorsed by Apple and by such partners as IBM, Novell, Oracle, WordPerfect, and Xerox, OpenDoc had been launched in 1993 under the aegis of the cooperatively run Component Integration Laboratories. About this time, Apple’s age-old competitor Microsoft began including its software mix-‘n’-match standard, OLE (Object Linking and Embedding) 2.0, in its Windows and Mac applications. Both OLE and OpenDoc allowed users to transcend merely cutting and pasting data among applications — for instance, when you clicked on, say, spreadsheet data pasted into a word-processing document, the spreadsheet application’s menu bar appeared and the data could be manipulated as spreadsheet data. OLE, however, suffered from a serious setback. Microsoft was in no position to be as vigilant a policeman of the interfaces of third-party applications as Apple was with Mac applications. So with OLE, every time you clicked on different items in a compound document, you played Russian roulette with your interface: Menu bars rearranged themselves, keyboard command equivalents changed, the positions of navigational tools were in a continual state of flux, and so on. The OpenDoc format began to win market acceptance around 1995. And thanks to the consistent interfaces of OpenDoc-savvy programs, Apple’s standard eventually garnered broader support than OLE across Mac, PC, and UNIX platforms. What clinched OpenDoc’s success was when Viacom began broadcasting its cable-TV lineup in the OpenDoc format, so it could be uploaded directly into Mac-compatible home-electronics control consoles. The other major change in software was the advent of intelligent agents that provided built-in expertise on accomplishing the task at hand. Apple’s first attempts at using intelligent agents were clumsy — for instance, the first Newton, the MessagePad, had only a limited set of action words its intelligence could recognize. Microsoft — in several of its Windows applications — led the first real attempt at personalized software. Its software “wizards” helped users perform such tasks as creating charts in spreadsheet programs (for instance, suggesting chart formats appropriate to the selected data). They also automated tasks by detecting patterns in the way users interacted with their software. But in the mid-1990s, Apple leapfrogged Microsoft’s lead, by creating (and subsidizing) standard MagicHelp agents, which third-party developers could add to their software. In contrast, Windows-based agents were limited to products from a handful of large developers. These two trends — smart agents and mix-‘n-‘match software — signaled the end of the era of escalating featuritis in applications. Mac users preferred to customize their own suites of applications built from scaled-down software components that seamlessly plugged and played together. And as a result, small developers — who were now better able to compete against the major players — flocked back to the Mac market. The long-awaited Next Killer App — RealDraw, a revolutionary product from a former NeXT developer — finally arrived in 1997. RealDraw used a graphics-recognition engine based on technologies pioneered in the Newton operating system to deconstruct 2-D images and form 3-D models from their components. You could simply scan in a photograph to create a realistic 3-D model that could be rotated, distorted, edited, morphed, or viewed from any vantage point. The sudden ubiquity of 3-D models prompted sweeping changes in the Mac’s antiquated hardware interface: 3-D mice (cordless, of course) became commonplace, and scanners were a must. In 1999, Apple also introduced a virtual-reality extension in System 9, prompting a flood of new games and entertainment and educational software (which finally helped Apple regain its dominance in theeducation market). All of a sudden, Mac users were sitting at their desks wearing expensive but fashionable headgear and nodding voraciously at their computers. A rash of neck injuries made the news. With CD-ROM drives built in to all new machines since 1994, an upgrade of the floppy drive was long overdue. In 1995, Apple went out on a limb by offering a PCMCIA option in lieu of the floppy drive on desktop machines and notebook computers. Although the $15 10-megabyte cards cost more per byte than floppy disks, users were surprisingly quick to adopt the new format. The extra elbowroom proved essential, and the cards allowed users to easily swap data among their notebook, PDA, and desktop machines. Floppy disks persisted for a few years as a disposable form of distributing and sharing software and data. But by 1998, as the price of a 20-megabyte PCMCIA card dropped to less than $5 and most files couldn’t even fit onto a standard 6-megabyte floppy, floppies drifted off to data-storage heaven. 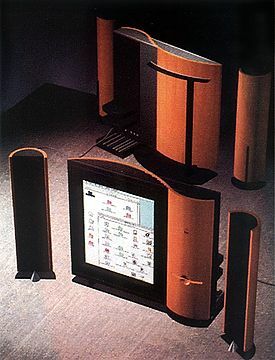 The last monochrome desktop monitors went the way of the dinosaur in 1994, and the last gray-scale notebook computer was discontinued in early 1996. By the year 2001, CRT-based monitors were discontinued. Flat-panel units had long since become commonplace for 16-inch (and smaller) displays. And as flat wall-mounted TVs caught on in the living rooms of America, the economies of scale for flat-panel displays (coupled with their reduced energy costs and low electromagnetic emissions) made flat panels viable for even the largest monitors. It’s hard to imagine these days, but before 1996, most people had separate telephones on their desks and when they traveled, they carried both a notebook computer and a cellular phone with them (along with separate chargers and spare batteries for each). As cellular technology got cheaper and more common, however, most computers began to include cellular-phone functions inside the box. Then computer manufacturers went a step further. All Macs released since 1996 have included sophisticated telephony features — auto-dialing, speaking, recording, voice mail (integrated with e-mail, courtesy of AOCE), call forwarding, and caller ID — integrated onto the motherboard. Apple’s alliances with AT&T, BellSouth, Northern Telecom, and others ensure that Mac-based telephony works with virtually all business PBX and wireless systems. With hardware margins continuing to tighten, Apple — like many other vendors — turned to the fashion aspect of computing as a road back to profitability. The Mac has always been a leader in design that was both functional and aesthetically pleasing. But it was only after the PowerBook replaced the cellular phone as the de rigueur techno status symbol in Hollywood and in the Business Class section of coast-to-coast flights that Apple began emphasizing the Mac (and in 1993, the Newton) as a personal fashion statement. As computing devices became smaller and were more likely to be kept continually on your person, their role as fashion accessories and politically correct statements became increasingly important. The old standards of price, performance, features, and usability were joined by such matters as status-seeking industrial design and eco-concerns such as energy efficiency. The most expensive (and most popular) products included those made from 100-percent recycled plastic. Of course, you could buy a variety of covers for the box — natural-colored synthetic leather and neon bright-colored rubber were the most popular. And to help you find these now-minuscule computers, you could easily train them to emit a customized noise when you said the word lost or any other four-letter word. In 1995, Apple finally caught up with the “value PC” trend that transformed the Intel-chip-based world and spun off the Performa line (along with the original Newton PDAs and the Claris Clear Choice software line) into a separate direct-sales subsidiary, AppleCore. To help finance these changes, Apple sold a 10-percent interest in itself to Sony. Then in 1997, Sharp, the dominant manufacturer of color active-matrix LCD screens, acquired a 15-percent stake in Apple. Sharp wanted to leverage Apple’s growing presence in the consumer-electronics market. In 1998, in the aftermath of the Sony/Sharp merger, SoSharp owned the largest single chunk of Apple stock and gained a controlling interest on Apple’s board of directors. A year later, Sony-labeled consumer products began sporting interfaces designed by Apple (or really by Apple’s subsidiary General Magic) as well as the AppleSmart logo. Millions of VCRs finally stopped their endless blinking of 12:00–12:00–12:00. And shortly after the ’00 presidential elections, Apple chairman Ross Perot left the company to become President Dole’s ambassador to Japan. In late 2003, in a sentimental reunion of sorts, Disney CEO John Sculley and reinstated Apple CEO Steve Jobs presided together over the ribbon-cutting ceremonies for MacDisneyPlace, near Apple’s new corporate headquarters, in Austin, Texas. In addition to interactive virtual-reality “rides,” the amusement center includes such tongue-in-cheek attractions as Software Pirates of the Caribbean and Mr. Gates’ Wild Ride. And to nobody’s surprise, one exhibit in particular is generating the longest lines: Tomorrowland. Jon Zilber, a former editor-in-chief of MacUser, commutes to his job at Spacely Sprockets in his AppleSmart HeloCar.